After the wars of the mid-seventeenth century, the English government needed solid information on land ownership throughout Ireland to carry out its policy of land redistribution. The Books of Survey and Distribution record ownership before the Cromwellian and Williamite confiscations, c.1641, and after, c.1666 … more info . . . The Books for Clare, Galway, Mayo and Roscommon have been published by the Irish Manuscripts Commission. For other counties, manuscript copies are available at the National Library. The Books of Survey and Distribution for Mayo are available in the Library in Castlebar while the Galway Library in Cathedral Square holds the Galway book . 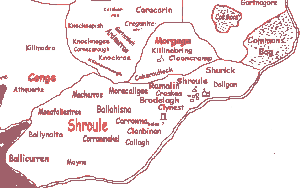 Stafford Inquisition of County Mayo 1625-35. 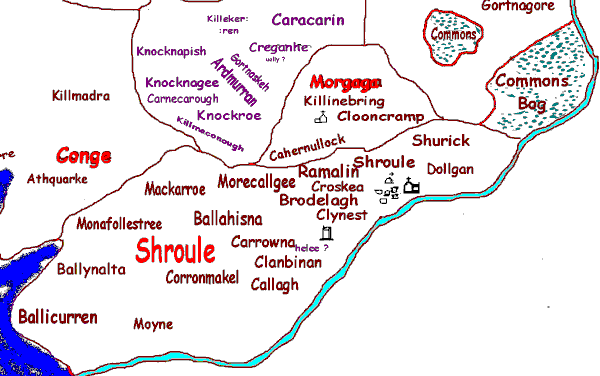 Landholders and others named in an inquisition which opened in Ballinrobe on 31 July 1635 . Books of Survey and Distribution use information collected in 1625 where Down survey data was unavailable . Following the Cromwellian Conquest of Ireland at the beginning of the 1650s, the Commonwealth government was indebted to many private individuals – adventurers – who had advanced sums of money to finance the war in Ireland. In addition to this, many soldiers who fought in the war were owed large arrears of pay. Both classes were to be repayed by the granting of confiscated lands in Ireland. To facilitate this extensive transfer of land, William Petty was appointed, in 1654, to measure and map, within 13 months, the forfeited lands, the crown lands, and the church lands in the 22 counties set apart for the soldiers. ” According to the scheme of the Parliament for suppressing the Irish Rebellion (of 1641), 2.500,000 acres of Irish lands, to be forfeited, were offered as security to those who should advance moneys toward raising and paying a private army for subduing the rebels In Ireland. The great William Petty will always be remembered in Ireland as the director of the first detailed and extensive scientific survey of Ireland, The Down Survey. Outside of Ireland, however, there is little known of William Petty the mapmaker. Outside of Ireland Petty had a considerable reputation as an economist, statistician, scientist and philosopher. He was a member of the Parliament of England, a physician, a linguist, an inventor and entrepreneur who could list co-founder of the Royal Society, Professor of Anatomy at Brasenose College and Professor of Music in London amongst his many other accolades. The reason why this 31 year old genius son of a Hampshire clothier came to Ireland can be summed up by ambition and desire for wealth and possibly power. His adventures in Ireland succeeded to that end and ensured that he led a comfortable existence for the rest of his life. By 1652 he had taken leave of absence from Oxford and decided to take an appointment as physician-general to the Cromwellian army in Ireland. At this time Cromwell’s forces and those ‘adventurers’ who had lent funds for the campaign were compensated in confiscated land as a means of ensuring that the army was self financing. The need for a proper survey to equitably conduct the dispersal of forfeited land was of the utmost importance. And when a government’s debts are being paid in acres, it needs to be done correctly. This was an enormous task, which involved an organisation consisting of over 1,000 surveyors and assistants, but was nonetheless completed in about five years. As his reward, Petty was granted about 30,000 acres in Kenmare, Co. Kerry and a cash payment of £9,000. An enormous amount, which led to persistant court cases and charges of bribery and breach of trust until his death in 1687. None of which were ever proven. For various reasons, the final engraving and printing of his work did not appear in atlas form until 1685. The atlas, “Hiberniae Delineatio”, was published by Petty himself and consisted of 36 maps. A charming and highly popular atlas, even if the maps looked a little primative, it was reprinted by Petty’s son, the Earl of Shelburne, in 1732 who authorised Dublin bookseller George Grierson to re-use the original plates. A reduced version had already been released by well known craftsman Francis Lamb a to coincide with the initial publication. This was published by Robert Morden and William Berry in London, under the title “A Geographical Description of the Kingdom of Ireland”, and went to a number of reprints. The last edition of Petty’s atlas was published by John Bowles in 1732, with plates identical to his previous issue in which he had corrected omissions from Petty’s original and added roads. The enduring legacy of Hiberniae Delineatio, was the fact that no large survey of Ireland with the detail of Petty’s was carried out within the next century. Many other cartographers simply copied Petty, warts and all, for the next 100 years, sometimes with an attribution, but more often without. The longevitity of his work can be attested to by the fact that Petty’s maps were still being referred to in land disputes right up until the advent of the Ordnance Survey, nearly 200 years later. Petty’s maps are today highly prized worldwide by collectors of early maps.